There are no proper headrests in the rear and no central armrest either. However, the spacious seats, the perfect backrest angle and the ‘hip’ point translate into a comfortable sitting posture. It’s not just passenger space that’s class-leading. Storage space is phenomenal too. Apart from the massive cooled glovebox, there are lots of useful cubbyholes, generous door pockets and seven bottle-holders! 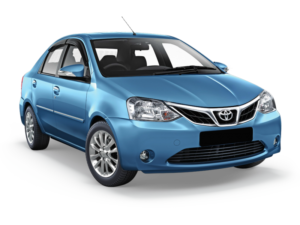 To top it off the Etios has a 595-litre boot which can easily swallow the luggage of five passengers on a long holiday. The quirky dashboard design does take some getting used to, but once you get accustomed to the new layout, the change is actually quite welcome. Surprisingly, for all the chopping and changing, the functionality of the cabin is brilliant. The chunky steering with its dimpled finish feels terrific and the white semi-circular speedo and tachometer are quite distinctive, especially when lit up at night. The ride quality on the Etios is very good but the suspension is stiffly sprung and hence some sharp bumps filter in the cabin. However, the car never loses composure and always remains stable irrespective of road conditions. The steering offers brilliant feels and feels great to operate. The car feels eager to dive into corners but on heavy cornering, the tail slides out due to the rear end of the car being a bit too light. Braking performance is also good and confidence-inspiring.